If you're anything like me, I had you at "chocolate" and sealed the deal with "pie", didn't I? Seriously, you guys. This pie was UN. REAL. I mean, just look at it. I think I'm going to have to make it a holiday tradition - even if it's just for me. As I mentioned in my Instagram post last night, I don't "restrict" myself on the holidays (or ever). Since I struggled with restrictive/binge eating disorders, I know that this only triggers negative feelings toward food. Not going back there - ever! Instead, I try to eat what I want/am craving in moderation, and try to avoid those foods I know my body just does NOT like (which is mainly dairy and soy). 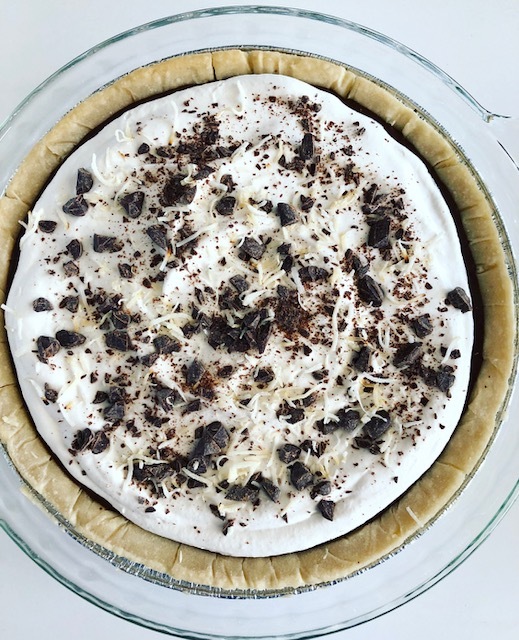 Desserts are almost always dairy-rich, so I wanted to make something this year that I could thoroughly enjoy - pain free! Ready for the recipe? You're gonna want to print this one out FO SHO! In a heavy saucepan, whisk together the arrowroot starch, cocoa powder, and coconut sugar. Add in the almond and coconut milk, whisking constantly over medium heat. Allow to come to a gentle boil and then continue to whisk for 2 minutes, or until it thickens. Remove from heat and add the chocolate chips and vanilla; stir to combine. Allow to cool to almost room temperature and then pour into your prepared pie crust (I baked mine for 8-10 at 375 per the package instructions). Pop into the fridge for 2 hours to set. Then top with the coco whip, chopped chocolate, and toasted coconut (I just toasted it in the pan for 2-3 minutes). That's it! Let me know if you make this and what your guests thought! And, as always, don't forget to tag me in your posts (@fit_n_clean_mama) so I can see your skillzzzz! I hope you all had a blessed Thanksgiving!